Riviera Cliffs Golfer's Dream Home! Riviera Cliffs Golfer's Dream Home! 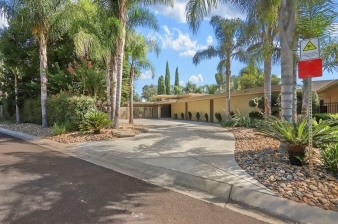 One of a kind Mid-Century Modern Single Story on Stockton Golf and Country Club's Hole #1! Gorgeous views from the many floor to ceiling windows! Gated front entry. Mas bed w/slider to patio. Remodeled Kitchen w/large skylight. Light and bright! Amazing architecture through out! Sparkling wading infinity pool w/ waterfall. Huge covered patio great for outdoor parties & relaxing! A rare opportunity, Only 12 homes located on this Exclusive Private Country Club!